Give a truly unique gift ! as early as age four. She was the one who just "knew things" about people or situations around her.Her work, today, as a Psychic Intuitive Medium - sharing her insights and connection with Spirit in a refreshingly grounded, no nonsense, down to earth manner - is a direct result of that journey. Beyond the deeply rewarding work she does through private readings, workshops, and life coaching sessions, Angela's connection with Spirit has benefited others in numerous ways. Her work with the FIND ME group is one example. Based out of Phoenix, Arizona, this not-for-profit organization of Psychic, Investigative, and Canine Search & Rescue volunteers works together in locating missing persons and solving homicides internationally. As a proud member and one of approximately 100 vetted Psychics relied upon by FIND ME, Angela supports law enforcement and families by creating opportunities for closure in what are obviously very difficult situations. 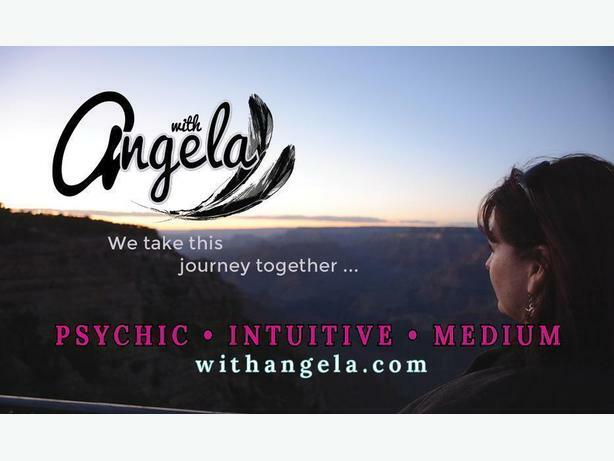 Follow Angela on Facebook for insights, fun intuition exercises, giveaways and more!